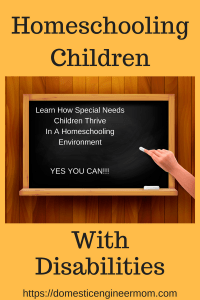 Qualified To Homeschool Special Needs Children? 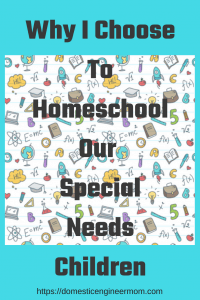 Choosing to Homeschool our Special Needs Children was probably an easier choice for us. I was already homeschooling our older two girls. Being able to choose what your children learn is something I don’t take lightly. 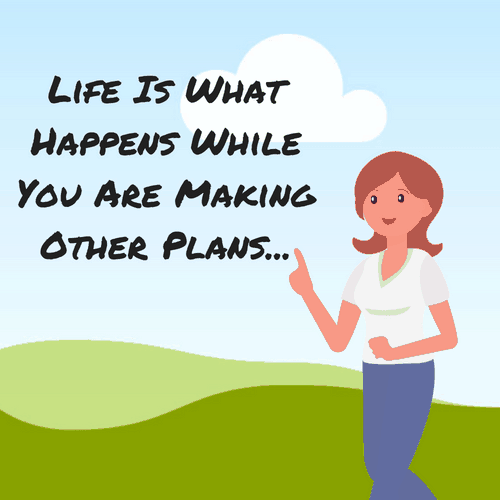 It can be a big undertaking with all the choices you have to pick from. Don’t be surprised if someone asks you what makes you qualified to homeschool your special needs child. Heck, I had people question me when I started homeschooling our first daughter. She had been going to public school for 2 years before I felt confident enough to homeschool. It helped to be around like-minded people that were already homeschooling. Well, my response is always what makes you think I’m not qualified? Homeschooling my special needs child gives them the advantage of going at there own speed. Excel at subjects that they are good at without being confined to the grade level that they are in. They are not distracted by other children while trying to concentrate. Both of our children have sensory issues so they are easily distracted. I can guarantee you that I’ve read more books and reached our options on homeschooling. I’ve reached out to others that have special needs credentials and have bought and researched so many options when it comes to curriculum. This may be a little off subject but I feel as though I need to share it. I was at a birthday party recently with both of our youngest children. They were both invited by a boy that has special needs also. I actually think most kids that were there had some sort of special needs. So obviously in good company, I’m referring to myself. It was in an escape room. Can you imagine 8 to 10 thirteen-year-old boys plus a couple of girls that either had Autism, ADHD, Dyslexia and other disorders all put together in a small room and had to figure how to get out? I’m sure the workers had a fun time watching them all trying to stay on task! There was a couple of adults in there to make sure nothing got out of hand. Well, my daughter has high anxiety and doesn’t deal with loud noises very well. They were only five minutes in and they were opening the door and letting her out. She was crying and having a panic account. I don’t even think most of the kids even noticed. If she was going to have a meltdown then this was definitely a safe place to have one. She got calmed down. We’ve been working on this in therapy for several years and she’s getting better on self-regulation. But actually, this is part of the story that just broke my heart. All of the mothers were sitting at a table and they were talking about kids going back to school. I was the only one there that homeschooled. I know one of the moms was a special needs teacher but not sure about anyone else. Most of these boys were either entering Jr. High or already going. I sat there and listened to these moms describe story after story of what their kids have to endure at school. The constant bullying, teasing, just plain mental torment. There was even a mom that said her daughter was bullied extremely bad in the 3rd grade. THE 3RD GRADE! I wanted to cry right then and there. My heart goes out to these kids. It’s hard enough being a typical kid but to have any kind of disability and then be ridiculed for it makes me so outraged! I can’t imagine being one of those moms and knowingly that my child is being picked on every day when they go to school. I understand that families have to have 2 incomes to make ends meet. Or you are a single parent and have no choice. I get it! Not everybody can be at home to homeschool there child. I recognize that there needs to be an accountability to schools, teachers, and parents because this is absolutely an epidemic. I’m so sick and tired of hearing people saying it’s just part of being a kid. No, being ridiculed, belittled and bullied is not part of being a kid. Disability or no disability it shouldn’t be tolerated at all! Ok, I will get off my soapbox and return to why I’m writing this post. I just want to say that I’m thankful for every day that I get to homeschool, my children! So as far as being qualified to homeschool, yes you are qualified. You are the only one that knows your child better than anyone else. Actually, my children have the advantage. We can attend therapy, go to Dr’s appointments and explore other educational opportunities and it doesn’t cut into our schoolwork. I would like to add that we do homeschool year-round. I want them to be able to retain what they have learned and be able to take off for other various things. You can do a traditional calendar or year-round. It’s a personal choice on our end. As far as them missing out on being social with there peers, I’m not concerned and either are they. We do extracurricular activities were they are around other children. But being social isn’t something I am pressed upon. They will make friends with whom they want to in there own time. You can’t force it. Don’t shoot the messenger! Have you seen and listened to the peers that are around your child’s age? Personally, I will pass and my kids recognize that also. They are very smart kids. They know what appropriate behavior is supposed to be and how you should act? Mine are 11 and 13 and they each other’s best friends. That’s a bond that absurdly priceless! Ok, let’s get on with why I homeschool my special needs children. Here you will find some details that I feel are important to know. I wish for this to help you and to make things easier. First, you will need an understanding of how your child learns. Depending on the learning disability you may need to have them tested to see where they are at. Both of my children have been in therapy since they were born. That actually gave me the general idea of where they stood when it comes to learning. Depending on the state you live in you may be able to get IQ Testing done at no cost. Some states allow the school district you are in to do the testing even though you homeschool. I would check with your district or state homeschooling association. Also, the HSLDA is a huge help especially when it comes to homeschooling special needs children. I do want to be totally honest with you, in that it’s challenging at best. 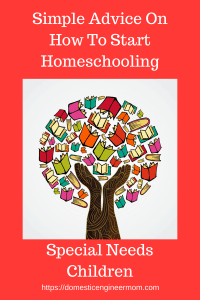 When you have made the decision to homeschool, let alone homeschooling a special needs child. Being flexible is an absolute must. But having a schedule of what needs to be done is also a must. I know that sounds like a contradiction but being flexible with your schedule is how I maintain my sanity! You might or might not have a direction of where your child is at intellectually. So now what? Go with what your child’s strengths are. This helps build confidence and yours also. Try to make what you are doing fun. You will get a better-engaged child. Also, this helps build your confidence also. Always remember your homeschool will not look like any others. Don’t compare. You can get ideas from others but build your own path. Time Managment will also play a very important role in your homeschool. Especially when it comes to homeschooling special needs children. I wrote a post on Teaching Time Management if you want to take a look. This can help tremendously! Also, I like to teach a certain subject in 30 min give a 10 to 15 min break and then start something new. I have found it keeps my kids more focused and on task. Remember there will be days that you will wonder why did I ever think I could do this. This has happened more than I can count. Even when I was homeschooling our 2 typical daughters. Don’t be hard on yourself. Homeschooling can get messy and you may cry some tears. Either you or your child will have moments of giving up out of frustration. Those tears and frustration are seeds, and those seeds grow when you see your child read or write for the first time. You may see them get excited about being able to do something on there own. Beleive me it’s all worth it. This is something I’ve always told myself. If it didn’t get finished today, it will be there tomorrow, and that’s ok. Enjoy this time with your children. It goes by so fast, too fast. Our first 2 girls have graduated from homeschool and have careers of their own. Be kind to yourself. Reach out to other homeschool moms. That’s where I got my best advice. We are all on this journey together and are willing to support one another! Please don’t hesitate to ask me a question. If I can’t answer it, I will find someone that does. This post may contain affiliate links for your convenience whereby I receive a small commission when you purchase through my link at no extra cost to you.